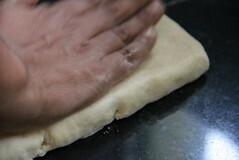 Classic Croissants with Aparna is already a hit with the recipe choice of #2 We Knead to Bake for the month of February! 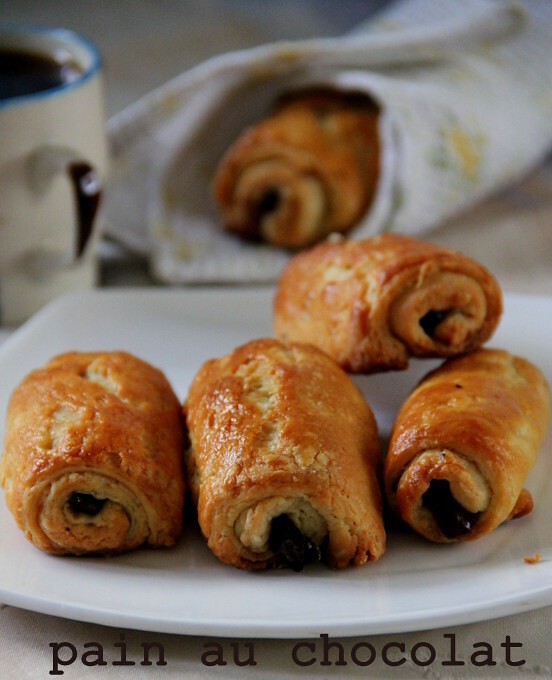 Pain au chocolat is a continuation of the same. 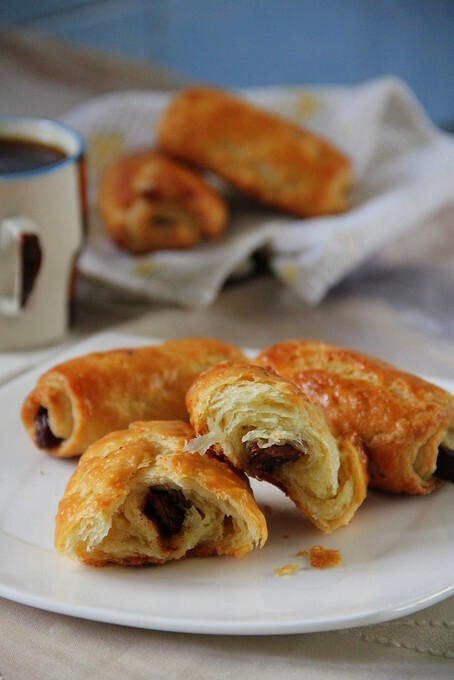 Now, pains au chocolat or chocolate croissants are nothing but puff pastries with rich creamy chocolate wrapped in, so that when you bite into it you have the buttery flaky outer layers giving way to the absolute 'yumminess' inside! It's a bit of hard work as the dough is prepared as the same for Classic Croissants. 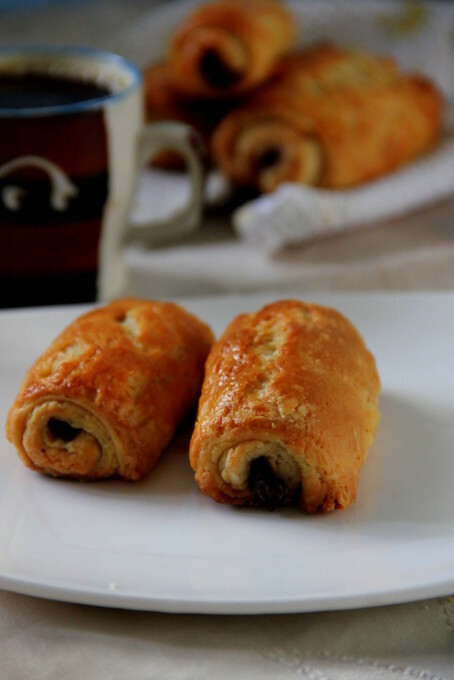 Personally, these cute chocolate stuffed rolls rose better and tasted awesome! 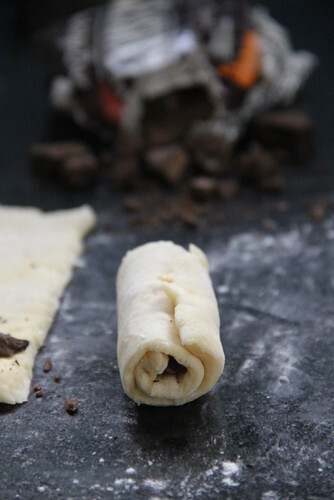 Basically with the dough explained down, you can roll not only chocolate but filling of your choice. A mix of coconut and cardamom, cinnamon and sugar, minced mushroom or chicken dry curry with caramelised onions are to name a few. Recipe for the dough is same as Classic Croissants, adapted from Jeffrey Hamelman's at Fine Cooking. I had halved the below recipe, laminated, made 6 medium sized croissants (posted here) with half the sheet and reserved the rest to make 6 pains au chocolat. 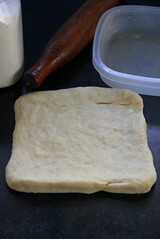 I am pasting the recipe down for the basic dough back from my Croissants recipe, to have it all again in one place. 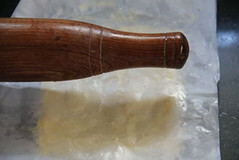 Combine all of the dough ingredients in the bowl of a stand mixer fitted with the dough hook. Mix on low speed for 3 minutes, scraping the sides of the mixing bowl once if necessary. Mix on medium speed for 3 minutes. (I used my hands to knead and didn't do it more than 2 minutes fearing the formation of gluten. My dough demanded a little extra liquid; a tbsp more of water and milk, the original recipe halved ). Transfer the dough to a lightly floured 10-inch pie pan or a dinner plate. ( I used a square sandwich box which is 3 inches deep. 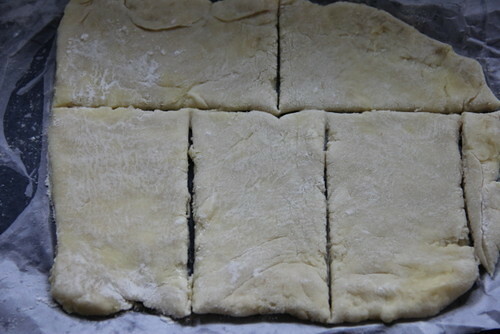 I chose the shape square, hoping to roll out and extend the dough to a square, without much difficulty for Day-2, again as the recipe says. It helped too :)Also, 'flatter' the dough, lesser the gluten formation during resting time. More the gluten, more the disobedient dough while rolling in Day-2 & 3). Lightly flour the top of the dough and wrap well with plastic so it doesn’t dry out. Refrigerate overnight. 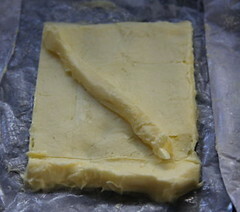 The next day, cut the cold butter lengthwise (and may be not across, as you see in the picture) into 1/2-inch-thick slabs. 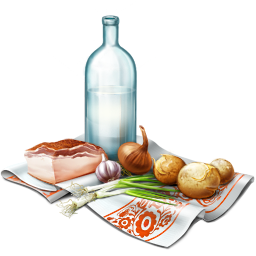 Arrange the pieces on a piece of parchment or waxed paper to form a 5- to 6-inch square, cutting the butter crosswise as necessary to fit. Top with another piece of parchment or waxed paper. 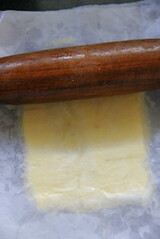 With a rolling pin, pound the butter with light, even strokes. As the pieces begin to adhere, use more force. 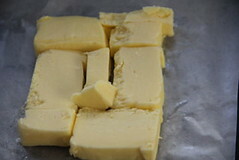 Pound the butter until it’s about 7-1/2 inches square. 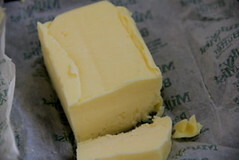 Trim the edges of the butter. Put the trimmings on top of the square and pound them in lightly with the rolling pin. 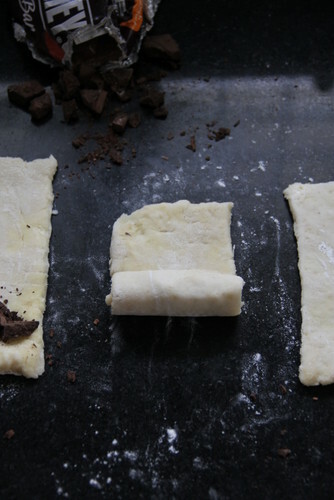 Refrigerate while you roll out the dough. 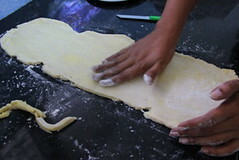 Unwrap and lay the dough on a lightly floured work surface. Roll into a 10-1/2-inch square. 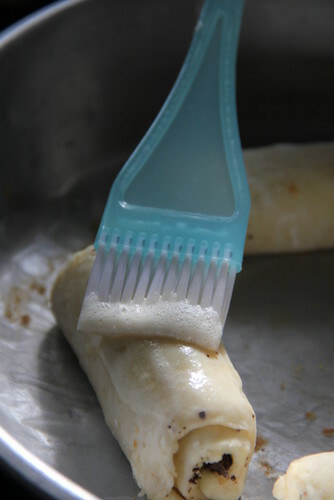 Brush excess flour off the dough. Lightly flour the top and bottom of the dough. 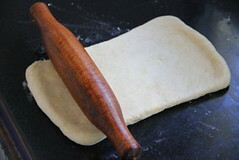 With the rolling pin, firmly press the dough to elongate it slightly and then begin rolling instead of pressing, focusing on lengthening rather than widening the dough and keeping the edges straight.Roll the dough until it’s 8 by 24 inches. If the ends lose their square shape, gently reshape the corners with your hands. Brush any flour off the dough. 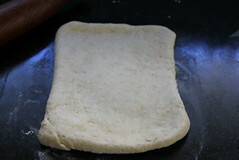 Pick up one short end of the dough and fold it back over the dough, leaving one-third of the other end of dough exposed. 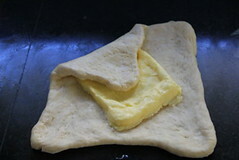 Brush the flour off and then fold the exposed dough over the folded side. Put the dough on a baking sheet, cover with plastic wrap, and freeze for 20 minutes to relax and chill the dough. Repeat the rolling and folding, this time rolling in the direction of the two open ends until the dough is about 8 by 24 inches. 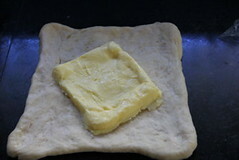 Fold the dough in thirds again, as shown in the photo above, brushing off excess flour and turning under any rounded edges or short ends with exposed or smeared layers. Cover and freeze for another 20 minutes. Immediately stick to the freezer ( not the fridge) and allow the butter to harden. Butter smudged dough is not the right one for croissants. Instead they need to be laminated beautifully between the layers of the dough with no seepage. I also saw butter leaking out through the holes from dough while rolling out. I dusted flour well,wherever the butter peeped and completed the process. This prevented seepage of fat to an extend. Remember, patch work with dough will not work! 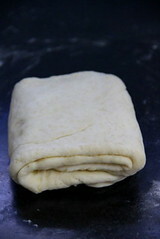 Give the dough a third rolling and folding. 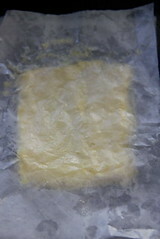 Put the dough on the baking sheet and cover with plastic wrap, tucking the plastic under all four sides. Refrigerate overnight. 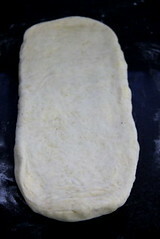 Roll the dough into a long and narrow strip, 8 inches by about 22 inches. 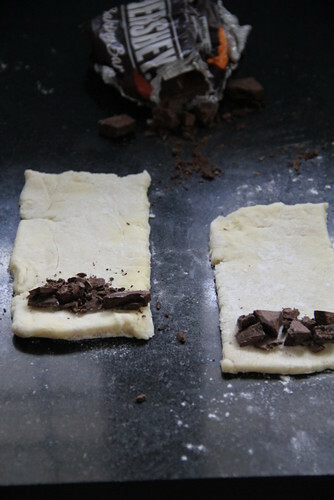 If the dough sticks as you roll, sprinkle with flour. 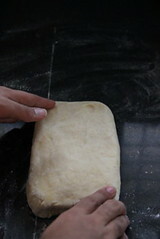 Once the dough is about half to two-thirds of its final length, it may start to resist rolling and even shrink back. 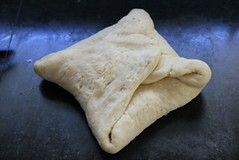 If this happens, fold the dough in thirds, cover, and refrigerate for about 10 minutes; then unfold the dough and finish rolling. Lift the dough an inch or so off the table at its midpoint and allow it to shrink from both sides—this helps prevent the dough from shrinking when it’s cut. Check that there’s enough excess dough on either end to allow you to trim the ends so they’re straight and the strip of dough is 20 inches long. Trim the dough. 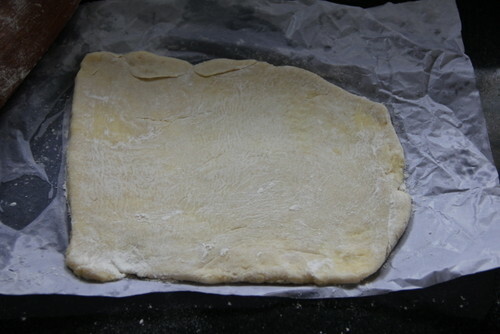 Let's, start from the reserved half of the sheet of laminated dough (this is therefore a quarter portion of the original recipe, since I had halved the recipe earlier to begin with) which was frozen for 4-5 days after making the plain classic croissants. 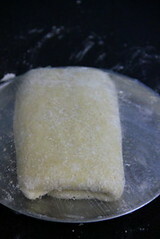 Roll the dough gently, dusting flour if sticky, smoothing the edges. Cut into rectangles with minimum wastage. My full rectangles measured around 2.5 by 5 inches. The std size of the rectangle I hear is 3 by 7 inches. That doesn't really matter as you may end up with smaller or larger rolls. Carefully sprinkle about a tablespoon of semi sweet chocolate chips or broken chocolate bits as a line on the shorter edge. Not too tight, not too loose. Pinch down the edges carefully to seal. 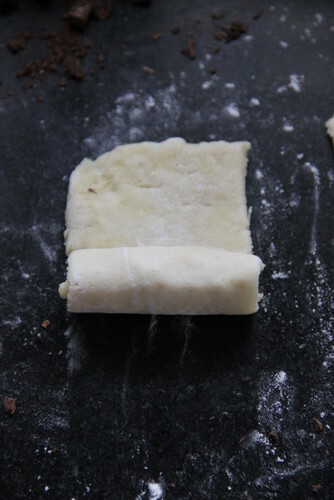 Place the seal edges downwards on a lined baking tray, leaving a gap of 2 inches in between. Make the egg wash by whisking the egg with 1 tsp. water in a small bowl until very smooth.Brush gently, the top, sides, seam and the edges. Refrigerate the remaining as you will need it again. 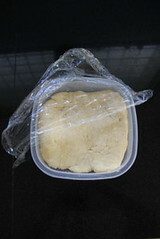 Cover with a baking tray loosely with plastic wrap ensuring it doesn't touch the dough. Leave to rise for about 21/2 - 3 hours. They really don't double in size after proofing but you may be able to see the layers that wiggle slightly if you shake the sheet gently. Shortly before the croissants are fully proofed, position racks in the top and lower thirds of the oven and heat it to 400°F convection, or 425°F conventional. Brush the croissants with egg wash a second time. Put the sheets in the oven. After 10 minutes, rotate the sheets and swap their positions. Continue baking until the bottoms are an even brown, the tops richly browned, and the edges show signs of coloring, another 8 to 10 minutes. If they appear to be darkening too quickly during baking, lower the oven temperature by 10°F. Let cool on baking sheets on racks. 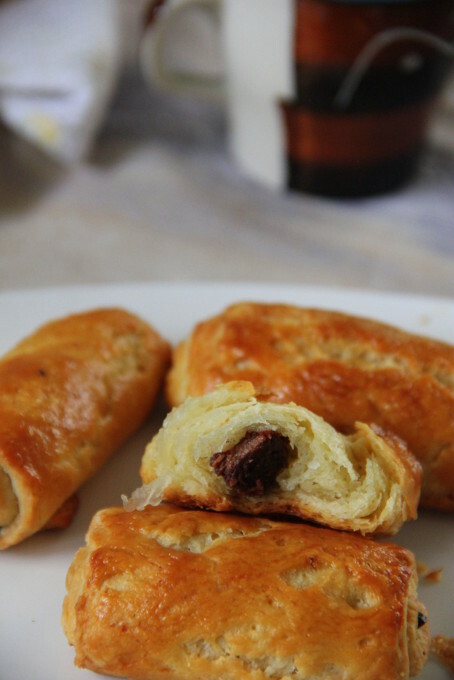 Crunchy flaky outsides and buttery soft layered insides complimented with the creamy chocolate: tasted just too good!! looks so delicious kids will love it.. can I do this with pastry dough? Drooling hereee,our family favourite and love ur patience for taking those stepwise clicks. 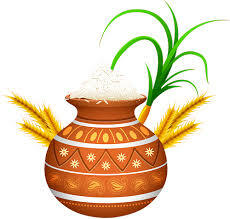 looks delicious bharathy :) loved the pictures completely ! that was meant to say - Delicious!!! I am sure my daughter will love this.....still haven't got around to making this. WOW WOW!!! SO delicious!!!! no words to describe its beauty!!! 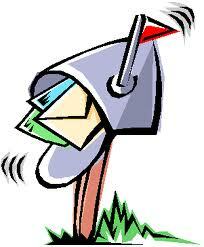 Wow, you have a lot of patience!! This so worth the effort.